Turkey's opposition Nationalist Movement Party (MHP) celebrated its 50th anniversary Saturday. "Thank Allah, we are in the same place where the MHP was founded, we're on the same line and in pursuit of the same will after 50 years," MHP leader Devlet Bahçeli said at a commemorative program in southern Turkey's Adana province. 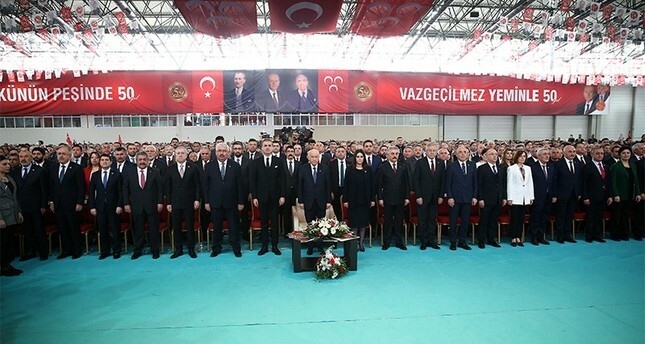 President Recep Tayyip Erdoğan, whose ruling Justice and Development (AK) Party has an election and parliamentary alliance with the MHP, also hailed the party's anniversary at a campaign rally in the Aegean province of Aydın ahead of March 31 local elections. AK Party spokesman Ömer Çelik and Vice Chair Jülide Sarıeroğlu were also in attendance. Alparslan Türkeş founded the MHP in 1969 and remained its leader until his death in 1997. Bahçeli has headed the party since 1997.